In the earlier pAsuram, AzhwAr said that others cannot know about emperumAn. In this pAsuram he is asking emperumAn whether he [emperumAn] knows about himself. viNNadhO – was it in the sky (which does not have a support)? maNNadhO – was it in the (dissolved) earth? bAlan thanadhu uruvAy – he was so small that if milk falls on one cheek, it will fill up the other cheek! bAlan thandhu uruvAy – even though he was in a form (as an infant) needing someone else’s protection, he protected the worlds. 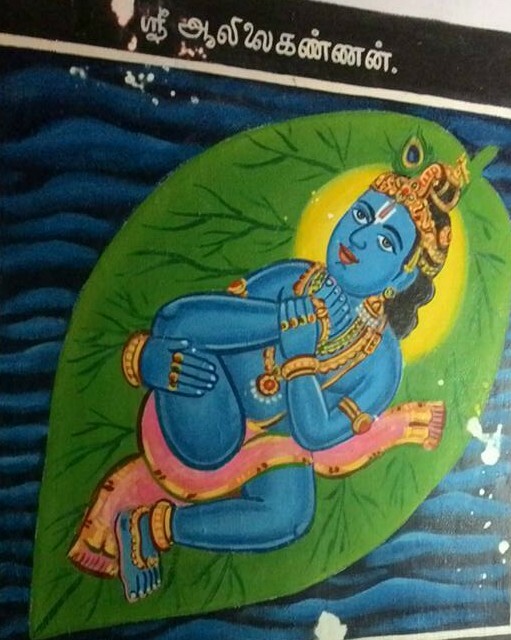 He contracted his form that is transcendental [emperumNa’s divine form, unlike ours, is not composed of the five elements but is composed of upanishaths) and became an infant. Ezhulagu uNdu – without any discrimination (that he likes some and dislikes the others) he kept all the entities, other than himself, in his stomach, and on top of the banyan leaf which was smaller than his form . . . .
mey enbar – For men of truth, this will appear as truth and for the others, it will appear as false. While the entire universe was under deluge, and there was flood everywhere, when there was not a piece of straw as far as the eye could see, where was that banyan leaf – was it on top of the ocean or was it on the unsupported sky [ether] or was it in the dissolved earth? If one were to ask where it was, it appears as if emperumAn wanted to hear it from AzhwAr himself. sOlai sUzh kunRu eduththAy sollu – one has to mention the wondrous activity of your [emperumAn] lifting the hill, supporting all the objects which were on the hill. The opinion here is that his ability to do the impossible acts can only be seen and enjoyed, and cannot be examined [by way of how he did it]. AzhwAr says that nowhere else can one see the objects being supported and the person supporting them in the same entity. Thus, AzhwAr says that he himself cannot explain his qualities. AzhwAr says that it was because of him that the earth, which was the support for the banyan leaf on which he was lying, did not dissolve in the deluge. We shall take up the 70th pAsuram next. This entry was posted in iyaRpA, mudhal thiruvandhAdhi on August 18, 2017 by T N Krishnan.